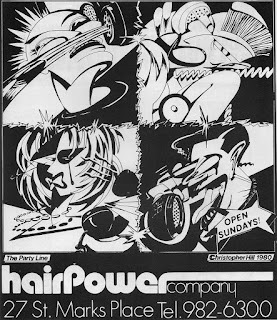 A CHANCE comment from Chris Pitzer at Adhouse Books led me to these two 1989 comics, The New Power Stars and The New Partners In Peril, published by Tami Comics (via Blue Comet Press). For anyone who knows about my decades-old obsession with Dr Peculiar and the many other strange titles (including Power Stars and Partners In Peril) published by John Jacobs' Madison Comics in the mid-80s, then you would understand why I was so thrilled to pick up these comics from Mile High (and for next to nix). They are a continuation of the bizarre superhero universe created by Jacobs and they're nearly as mad as the original books. The Christian vibe has been toned right down and the perverse sexual violence excised, but there's plenty of regular old weirdness to go round. When we last left the Madison Universe, Astroman and his brainwashed/drugged ward/former enemy Tami (a thinly disguised rip-off of Terra from DC's New Teen Titans) were chilling in Antarctica (see what I did there? Boom!). 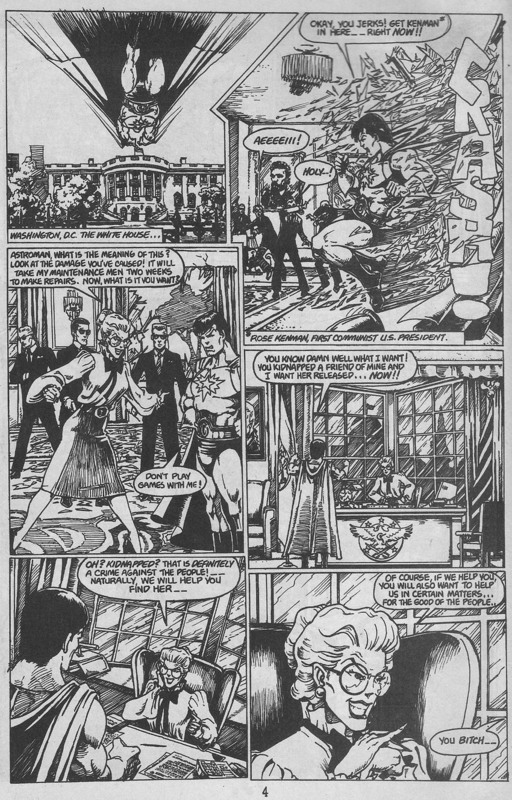 But in The New Power Stars #1, America is now run by a Communist, Russian-backed government, led by the evil and oddly schoolmarmish President Rose Kenman. In the first yarn ("Tami Unbound", writer: Dave Marchman/artist: Steven Hughes) the Prez forces Astroman to do her bidding to disperse illegal rally-goers, which pushes him to the edge of killing Kenman. Meanwhile, Tami is kidnapped by government agents for some nefarious experiment. In the process, the wristband that controls her psychotic urges is broken. She goes on a rampage before being rather quickly subdued by Astroman, who whacks another armband on her to keep her placid and compliant. The artwork by Hughes is perfectly fine, but the storyline (which I assume Jacobs had a hand in) is kinda batshit crazy. When and how did the Commies take over America? Did I miss something in Jacobs' original series? The next chapter ("American Vengeance", writer: CA Stormon/artists: Brian Pimenta & David Mowry) sees Astroman and another old Madison character Black Atlas take on anti-Commie vigilante American Vengeance. 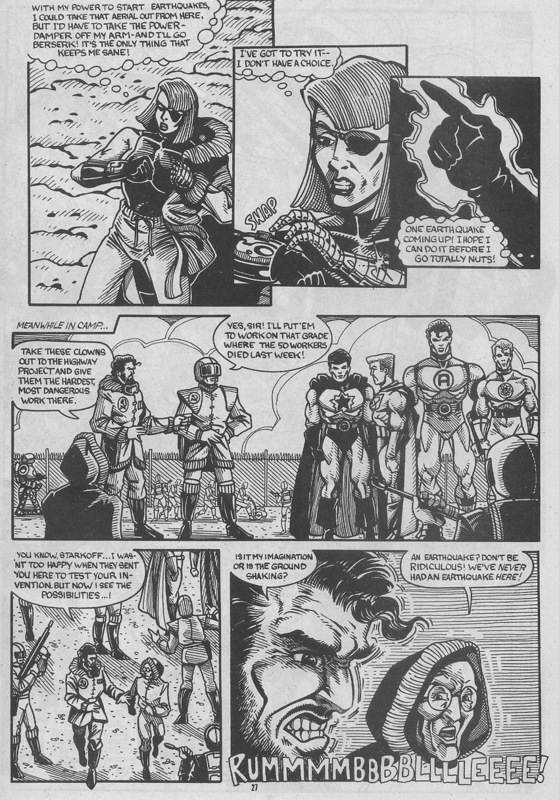 The last strip ("Astroman vs Super Soljer", writer: John Jacobs & Duval Stowers/artist: Duval Stowers) has a similar storyline with ultra-patriot Super Soljer battling Astroman, who he mistakenly believes is a traitor. This is the only "to be continued" yarn with Soljer getting blown up by MIG fighter planes on the final page. Oh no...will he survive? Well, we never find out. 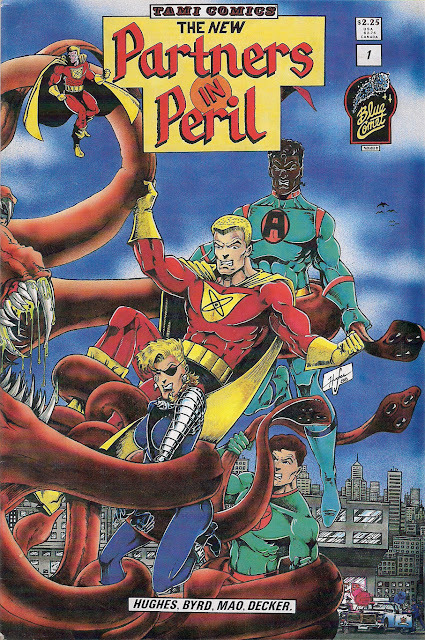 The New Partners In Peril focuses on the members of super-team Power Stars. We get the origin of Astroman (writers: John Jacobs and Dave Marchman/artist: Steven Hughes), which basically rips off Superman's origin. "You Say You Want A Revolution" (writer: Dave Marchman/artists: Mitch Byrd & Louis Paradis) sees the team split up over idealogical reasons when discussing whether or not they should overthrow America's Commie government. "Communisim is a disease, evil, a corruption of human thought!" snarls a Captain Atom rip-off. "Hey, back off, man! Communism ain't the worst thing - look at Adolf Hitler as proof!" growls some other hero who's so inconsequential that we never see his face, let alone find out his name. 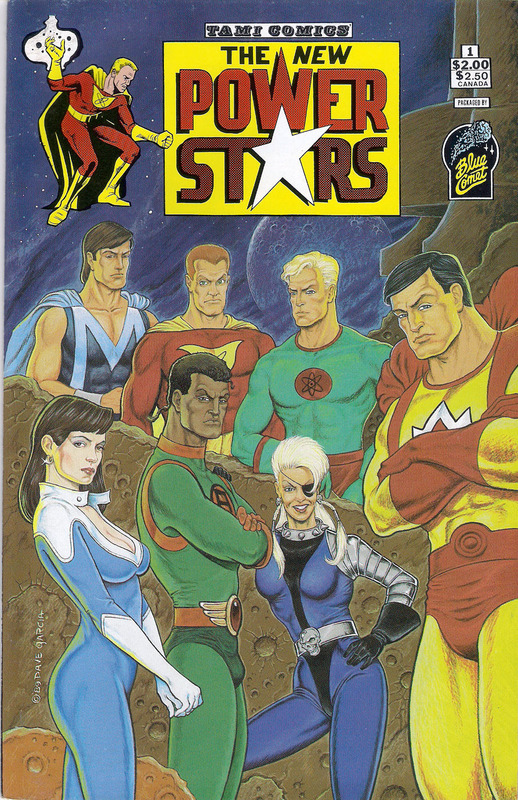 So the Captain Atom rip-off - we later find out he's called "Neutron" - snaps and quits the Power Stars. He joins the rebel movement and attempts to assassinate the Prez. However, his attempt is thwarted by his ex-team mates. After being defeated, Neutron suddenly comes to his senses and it's revealed he was being mind-controlled by aliens known as the Gibblers. It's all very clunky and mediocre fare, but not the off-the-wall crazy you'd expect from Jacobs. The final unnamed strip (writer: Dwight Decker/artist: Francis Mao) sees the Power Stars take down a sinister gulag in Alaska. However, they are captured and it's up to Tami to rescue the team using her earth-based powers. Unfortunately, in the process, her wristband gets shattered and she goes psycho once more, before Astroman again easily subdues her. So the storyline is basically a repeat of what happened in the other comic. Reading and rereading these two titles, it just makes me think, "Man, John Jacobs REALLY hated Communism." It's such a surreal idea to have America in the grip of some Red Dawn scenario. It must have been very confusing for the few hundred people who actually picked up and read these comics to be confronted by this fully-formed (well…semi-formed) alternative universe that's kinda loco. A bigger question is why Blue Comet Press got involved with a kook like Jacobs (although he was loaded, so I guess the cash helped). Sales must've been poor as these were the only Tami Comics titles published...and as far as I know, the comics were not revived again. Still, as bad as they are, I'm perversely thrilled to have them in my collection. 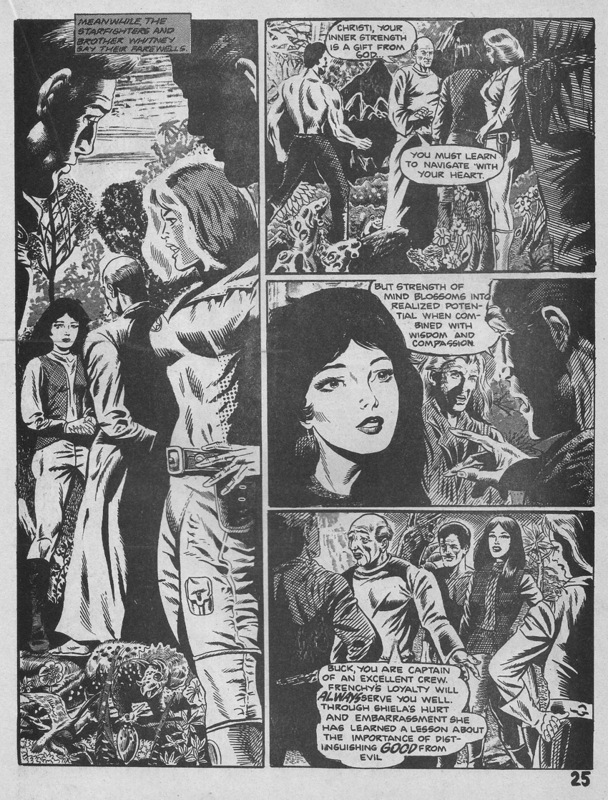 JOHN JACOBS couldn't write and he could barely draw when he put out Madison Comics, but his amateurish pencils were helped immeasurably by the inking of Ken Landgraf (who actually did some mainstream work as well). 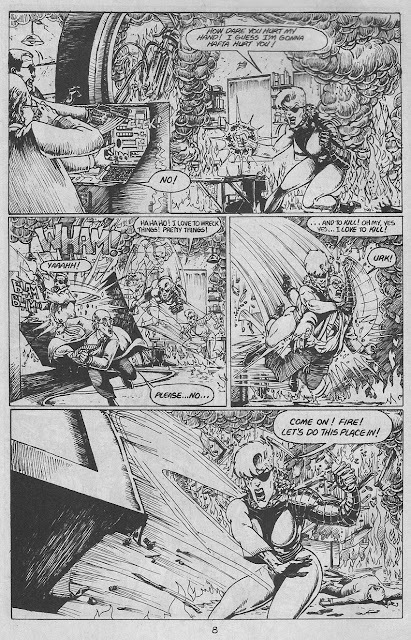 Ken, who still sells his original artwok on eBay, also produced his own comics around this time. 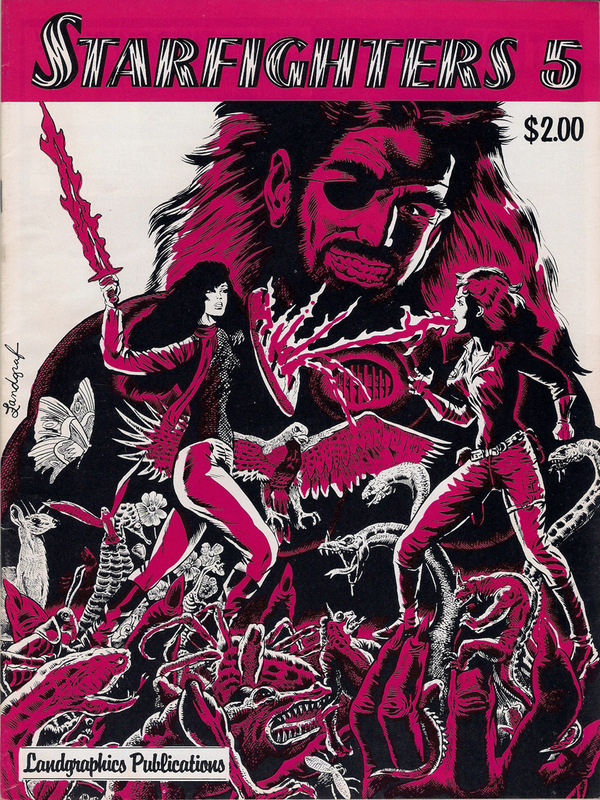 I recently found a copy of Starfighters #5 (Landgraphic, 1983) for a coupla bux in Comic Kingdom in Sydney. 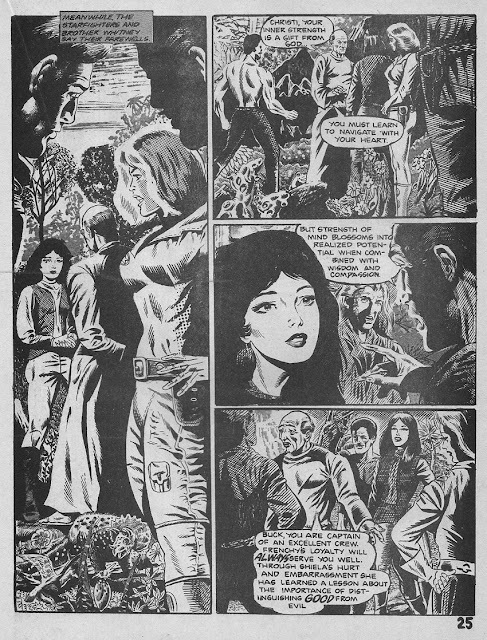 There's a lot of overt Christian imagery going on (which maybe explains Ken's affinity with Jacobs) plus some heavy Wally Wood influences in his artwork (I could call them swipes, but I'll give him the benefit of the doubt). The main feature is about a band of rebels the Starfighters fighting an evil despot. Sure it's cliched, but I bought this for Ken's artwork, not his writing. The back-up tales of "Axe McChord" and "Alien Squad" (with additional inks from semi-pros Willie Blyberg, Sam De La Rosa, Armando Gil and friends) have nice art, but they make zero sense. Who exactly Ken was trying to appeal to with this comic is beyond me. 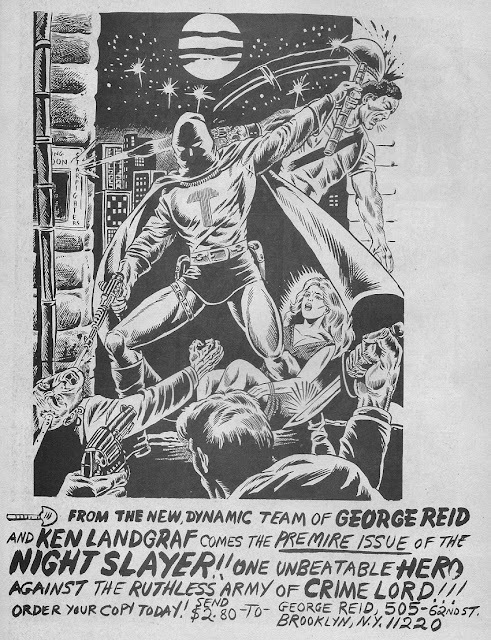 What I found more interesting were the house ads Ken ran, including the above full-pager for a Punisher-style character called Night Slayer. The real ads are even better. 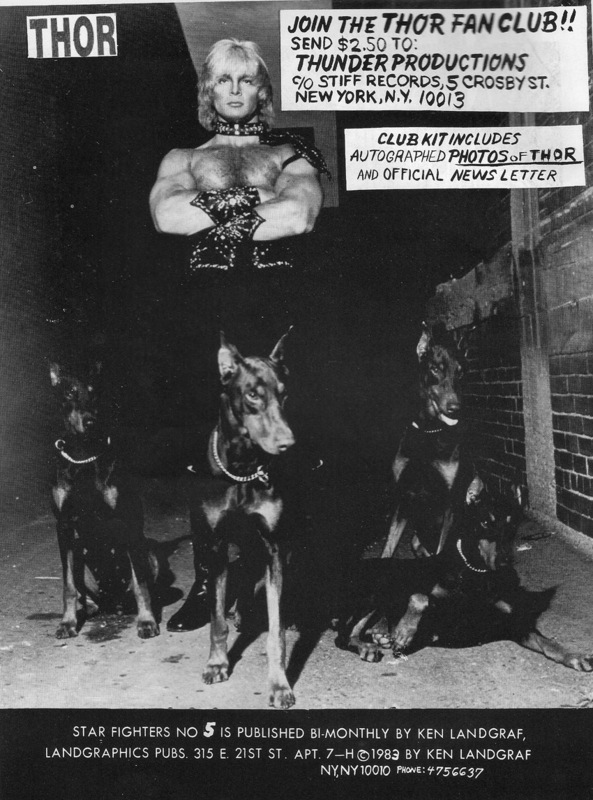 The fact that the fan club of heavy metal "legend" Thor got the inside front cover (below left) made the $3 I paid for Starfighters totally worthwhile. 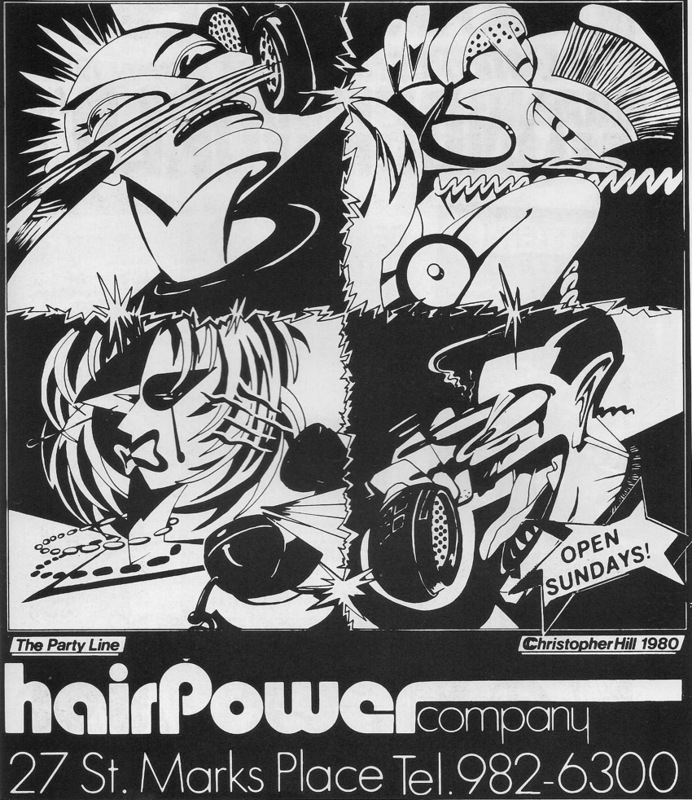 A local hairdresser got the inside back cover (below right), which I found hilarious. I wonder if it's still in business. 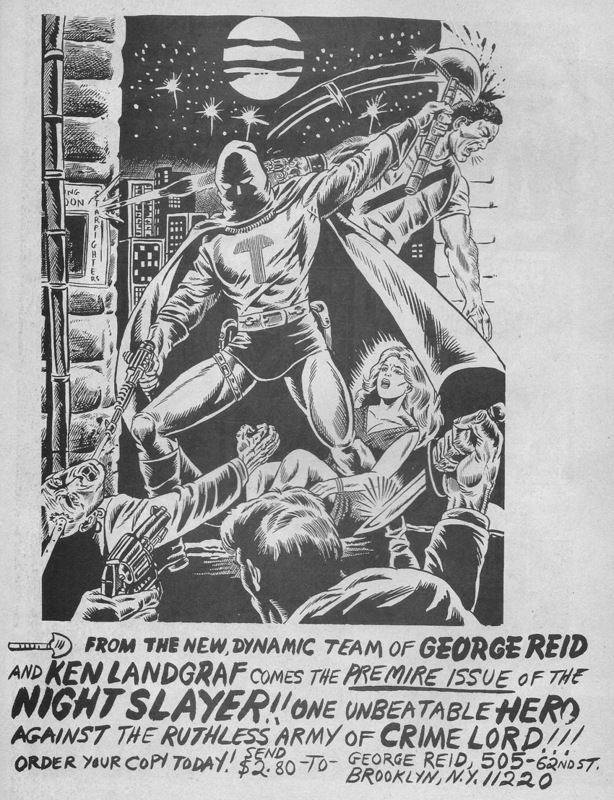 Someone needs to interview Ken - with John Jacobs' passing a few years back, Landgraf is the only person who can shed some light on what the hell was going on with John and Madison Comics. Hell, Ken's creative output over the decades would be worth an article by itself. Please feel free to leave me a comment over there or add yourself as a follower (or both), and I promise I'll reciprocate.